Secretariats—the administrative arms of international treaties—would seem simply to do the bidding of member states. And yet, as Sikina Jinnah argues in Post-Treaty Politics, secretariats can play an important role in world politics. On paper, secretariats collect information, communicate with state actors, and coordinate diplomatic activity. In practice, they do much more. As Jinnah shows, they can influence the allocation of resources, the structures of interstate cooperation, and the power relationships between states. 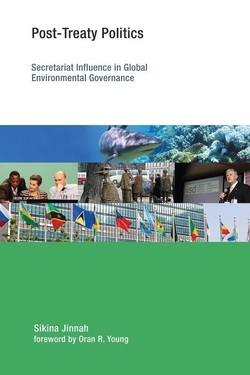 Jinnah examines secretariat influence through the lens of overlap management in environmental governance—how secretariats help to manage the dense interplay of issues, rules, and norms between international treaty regimes. Through four case studies, she shows that secretariats can draw on their unique networks and expertise to handle the challenges of overlap management, emerging as political actors in their own right. After presenting a theory and analytical framework for analyzing secretariat influence, Jinnah examines secretariat influence on overlap management within the Convention on Biological Diversity (CBD), two cases of overlap management in the World Trade Organization, as well as a case in which the Convention on International Trade in Endangered Species (CITES) secretariat failed to influence political outcomes despite its efforts to manage overlap. Jinnah argues that, even modest secretariat influence matters because it can establish a path-dependent dynamic that continues to guide state behavior even after secretariat influence has waned. Read more and purchase here. 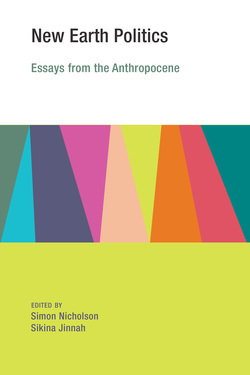 This volume assembles prominent scholars and practitioners in the field of global environmental politics to consider the ecological and political realities of life on the New Earth. Our intention in introducing the “New Earth” metaphor as an organizing tool was to provide our contributors the freedom to connect their prior work to the emerging Anthropocene literature, and to explore the changing nature of global environmental politics without being tethered to the terminological debates that currently characterize Anthropocene studies.We asked contributors to give particular thought to the relationship between traditional scholarly activities and the practical work of generating social and political change. The resulting essays range from meditations on the social and political drivers of environmental harm to musings on the state of environmental pedagogy, from analysis of the links between the environment and geopolitics to cutting-edge thinking about the future of environmental social movements, and from insights on the struggle to build more appropriate international environmental institutions to examinations of the imperative to craft more compelling narratives in the service of global environmental action.